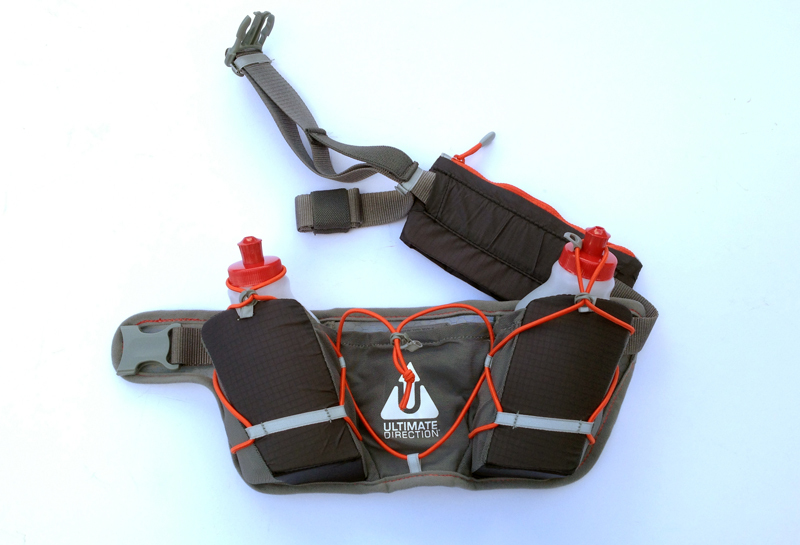 With the upcoming Spartathlon race, I was on the lookout for a new waist pack. My criteria was something small and lightweight with some storage capacity for a few essential items (i.e. 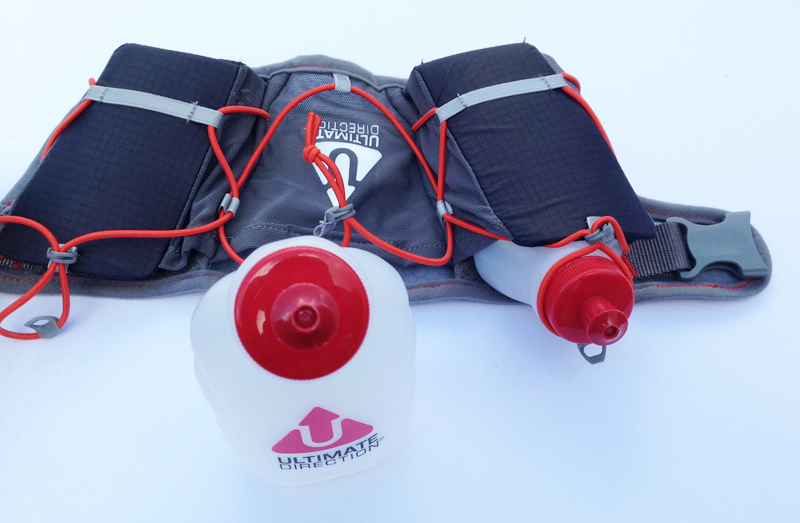 mobile phone, electrolyte tablets etc) and I settled on the Ultimate Direction Jurek Endure Waist Hydration belt. The Waist Pack comes in two colours: the grey and black (yes) and lime green/aqua blue type colour (not for me) as pictured below. The product also comes with two small 10oz (295ml each) bottles which allow you to balance the load across the waist. Two small bottles gave me the option of carrying both a water and a sports drink. The bottle holsters are stiffened at the front helping the bottles slide in and out easier when accessing the bottles on the run. 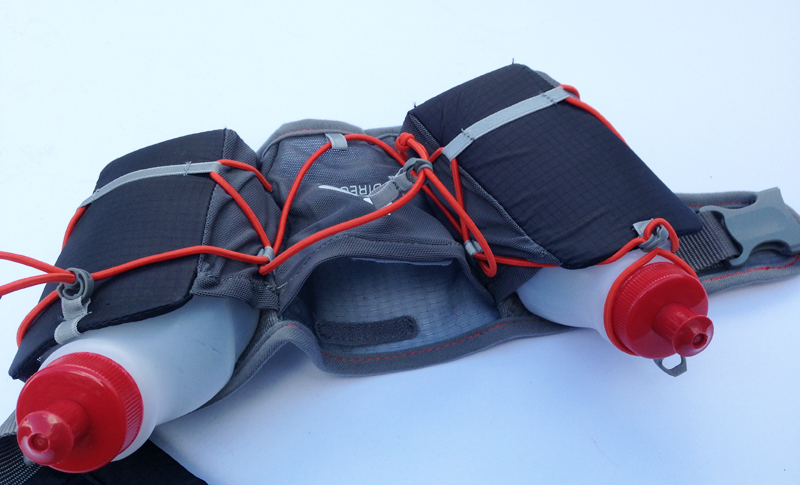 The back of the pack also contains a bungee cord which can be looped over the bottles to provide additional security. There is also a small plastic clip which allows you to fairly easily pull the cord off whilst grabbing the bottle whilst running. The bungee cord also allows you to stash a small item (a small jacket for example) on the back on top of a stretch mesh pocket which is fastened together with a Velcro strip. The mesh pocket at the back is wallet sized and can hold a couple of gels or small snacks. 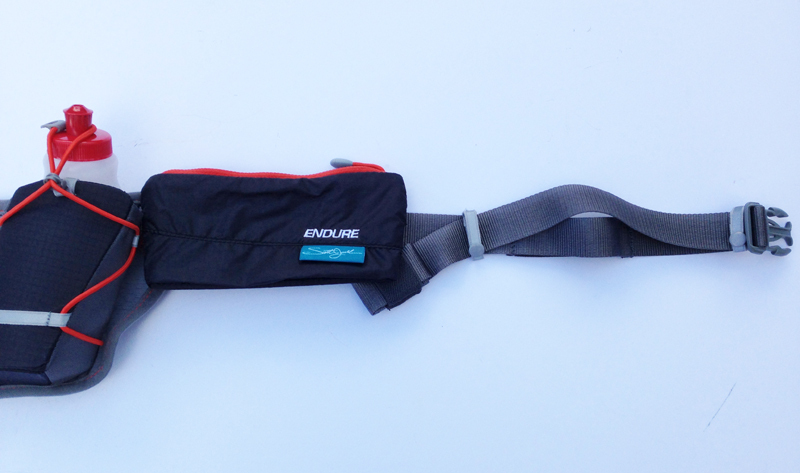 The front of the waist pack contains a zipped pocket large enough for a smartphone (my iPhone fits inside with an inch to spare) and an adjustable belt strap and moveable race bib clips. The pocket can be slid from the side to the front depending upon your preference. The waist pack feels sturdy and lightweight weighing an advertised 240g with empty bottles. Having used the waist pack on a few runs, I found this to be light, comfortable and also allowed me to carry a few essential items. Despite purchasing this for use in a specific race where regular checkpoints mean I don’t need to carry much water, I can see a use for this on my weekly medium length runs (around 10-12 miles) where it is useful to carry some water particularly in the summer, a phone, keys and maybe a small snack. Pocket Size: 16.5 x 7.6 cm / 6.5 x 3 in. Pouch Size: 10.2 x 10.2 cm / 4 x 4 in. Hex Mesh: The structure of this belt is totally breathable, while also being extremely strong, lightweight, and will not absorb moisture.